One of my favorite scenes, is Ramona’s first day of kindergarten. Ramona, tummy full of butterflies, is directed by Miss Binney, the teacher, to a desk, and is told to “Sit here for the present.” So, Ramona sits. 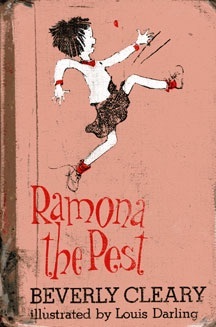 But Ramona has a busy mind, and her thoughts churn and churn,” What kind of present could it be?” (Oh, no! Back in the day, even my 7 year-old mind knew what was coming!) As the day wears on and no gift appears, the disillusioned Ramona questions the teacher. Kindly, the teacher explains the misunderstanding, and offers up an alternate definition of present. Ramona leaves her first day no older-but wiser. In my last blog post, (Picture a Christmas) I talk about anticipation as looking forward to. Ramona spent her entire first day of kindergarten anticipating the present, and in so doing, she missed all the other memorable aspects of her very-first-ever day of school! With that in mind, I want to share a recent experience I had that really brought home yet another definition of present, and that is being present. 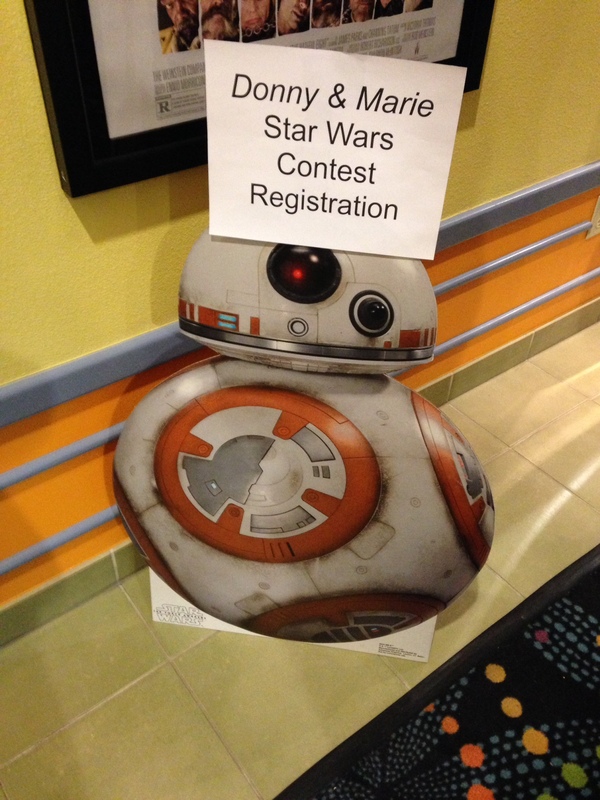 Last week, across my Facebook feed in classic movie “Star Wars” scroll, Marie Osmond announced a contest. The prize was two tickets to a private screening of the latest Star Wars installment, The Force Awakens. I’m not a Star Wars fan per se, (gasp!) but I am a Marie Osmond fan. (There’s that strong leading lady-thing rearing its head again.) So I did what any middle-aged, non-Star Wars fan would do. 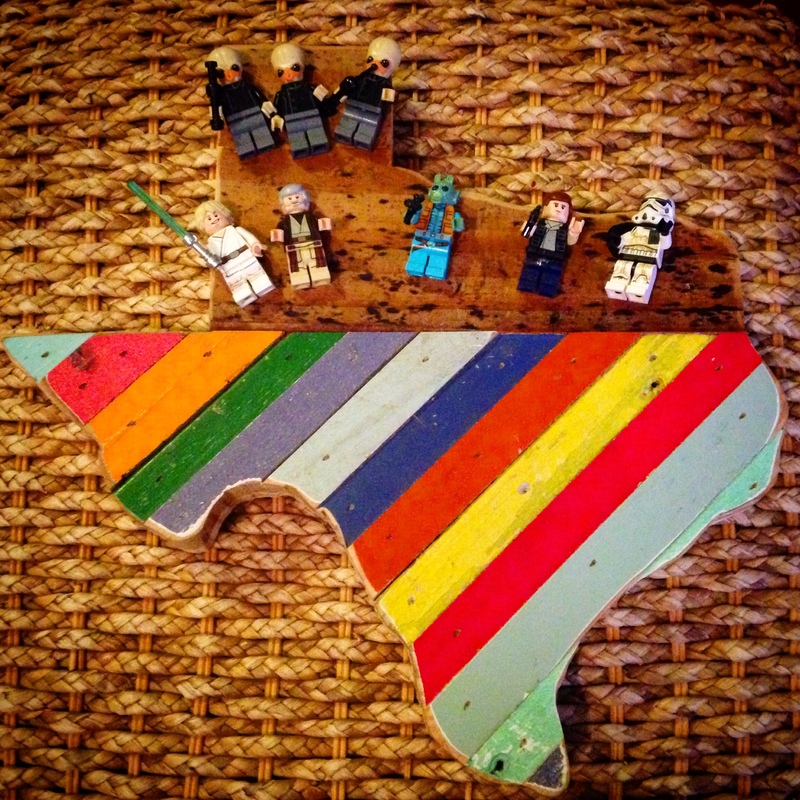 I grabbed my daughter, made her teach me how to Instagram, (arghh…read my even older post, Old Dog, New Trick,) took a crash course in hash tags, (or the pound sign as I still call it), mocked up a picture with caption, and posted away. I never win anything, and boy was I excited-what a gift for the holidays! I got a good dose of anticipation myself…picking out a slimming outfit, so I wouldn’t look like a middle-aged whale next to Marie; who, thanks to Nutrisystem and Body Gym is lookin’ mighty fine, I must say. I knew there was no time for fillers or Botox, so I prayed over my Oil of Olay, “regenerized” my face, and threw in my turkey neck just to be on the safe side. I wanded my unruly hair, and all in all, after spending more time primping then I did on my wedding day, I looked fairly presentable. At the premiere, we were queued up, and the excitement was palpable. Finally, a tour bus pulled in and the entourage of band members, crew, and dancers arrived. Then it was time. 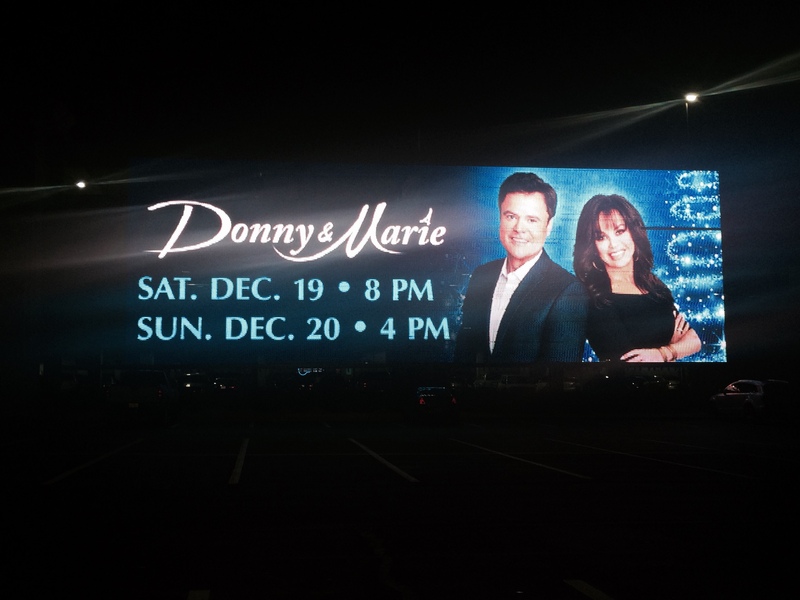 The glass theater doors swung open, and in walked Donny and Marie, amid whoops and cheers. Donny was as expected, but Marie is very small in person, and just a doll. Everyone had their cameras at the ready, snapping away and videoing as they passed directly by. I am technically-challenged, (snicker), so I made my daughter do the paparazzi work. The small crowd eagerly pressed forward into the theater the minute it was open. My daughter and I split up, me to get us seats, and she to get our popcorn and drinks, also gratis. (Thank you Donny & Marie!) What we didn’t know then, was that Donny & Marie had stepped behind the concession counter to “serve” the theater goers. 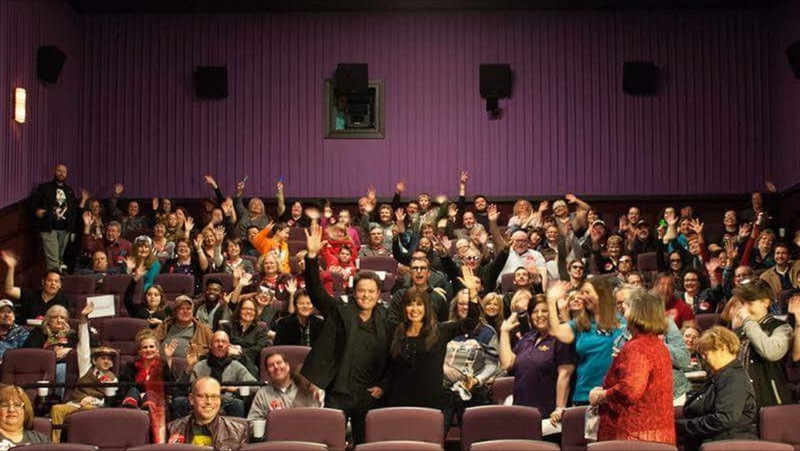 Most of the folks had rushed and grabbed their popcorn buckets and drinks prior to their arrival-anticipating the crush to see celebrity in person, and were already ensconced in their seats. 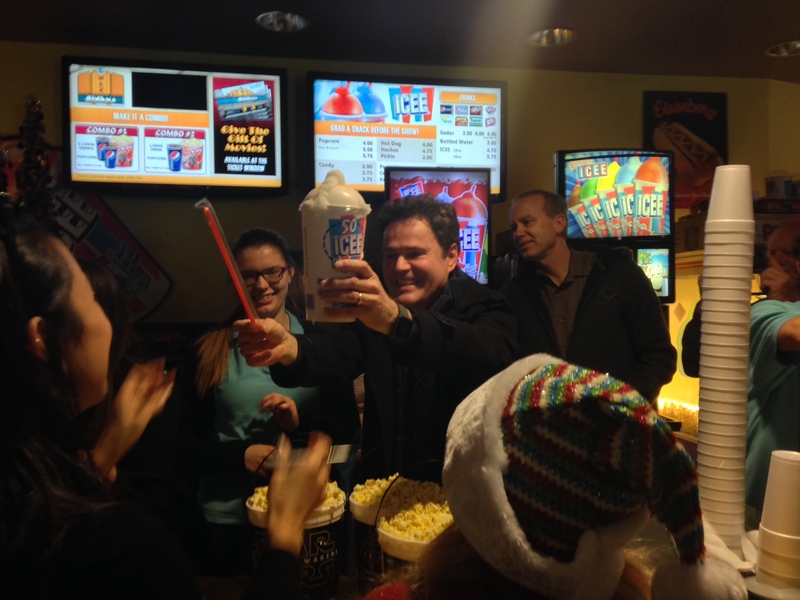 They were unaware that those that had waited, were up close and personal with D & M, as they chatted and served up popcorn, soda, and Icees. My daughter felt bad for me, knowing I was missing it. She stood back from the fray and took a couple of discreet pictures and brief videos to share with me. She shared that although she was excited to meet them, she didn’t want to invade their personal space. This was their Christmas gift to their staff and they had generously included their fans in the contest-but this was their preview as much as it was ours, and their free time as well. We felt like creepy stalkers, and we put our phones away for the night. D & M went on to graciously answer questions and joked around for about ten minutes. They were charming, down to earth, and open. As for Star Wars, even I enjoyed the movie! The 3D special effects were amazing, and the good vs. evil-believe me, I get. As we flowed out of the theater as a group, cameras were poised even at the restroom door for Marie to come out! Marie’s adorable daughter was there on holiday break with her, and we couldn’t help but contrast our mother/daughter night out with theirs. How hard it must be to live as a celebrity. How vulnerable you must feel, with strangers clamoring after you, and taking pictures left and right. No safe zone, no anonymity. We actually felt fortunate to NOT be talented and famous. (Yup, we’re lucky that way!) And here they were, more outgoing and fun than you can ever imagine, spending their night with us, and making sure everyone was having a good time. It was a gift indeed. Which brings me to the present. We had a wonderful time that night, but I couldn’t help but notice that we weren’t all present. As fans, we were so consumed with getting the picture, that we didn’t get the picture. Videoing is not the same as seeing Donny, Marie, and her sweet daughter Abi in person. Snapping away is not listening, interacting, or experiencing. Eyes glued to a screen, we are virtualizing the real thing! In our quest to make a memory, we are missing it as it’s being made. I’m just as guilty as the next guy. I had my daughter take the video, but I would have done it if I were technically savvy. If I didn’t hate selfies so much, I would have selfied! Luckily, since I need readers, can’t work my phone properly, and everything I snap turns out blurry, I got to enjoy seeing, being, and experiencing-by default. (And, because I have a wise daughter.) Like Ramona, I learned a lesson that day that left me wiser. Be aware in the moment, and savor it. The experience IS the gift! Two days later we went to D & M’s Christmas show, and it was a sparkly, dazzling, holiday extravaganza. Although it was taboo, folks filmed and snapped away the entire time. And as for us? We didn’t take one picture or video that night to remember it by. But we will treasure our memories. They were awesome seats, and we were just grateful to be present.